The public health people are firing up the fear propaganda machine earlier every year. You can see the signs and placards around town warning us about “flu season”. Those of you who’ve been around the practice for a while might guess that I’m not a fan of the flu vaccine and there is ample evidence in the scientific literature to prove my position. A Johns Hopkins scientist, Peter Doshi Ph.D. published a pretty scathing paper in the British Medical Journal on just how ineffective the flu vaccine is in protecting us from the flu. Specifically he noted that although the vaccine is pushed on the elderly, there is absolutely no evidence that vaccination has any impact on death rates in that population. What’s worse is that small children get no protection from the disease, yet 100% of them get a heavy dose of mercury which is known neurotoxin that depresses the immune system for days. Mercury overstimulates the brain and is correlated with a significant increase in Alzeheimer’s and other dementias according to neurologist, Russell Blaylock M.D. 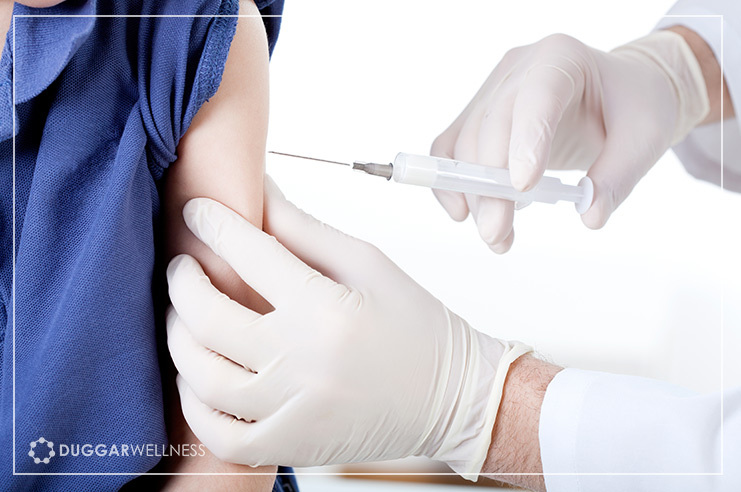 One study found that getting the flu shot 3-5 years in a row contributed to a 10-fold increase risk for Alzheimer’s disease. So What Should We Do To Prevent Illness? There are many safe, effective and natural ways to bolster your immune system. I’ve compiled a very short list of our favorite supplements and habits to focus on throughout the entire fall and winter and especially through the holiday season (which in this case begins with Halloween). First of all, we should realize that the reason we get more communicable diseases in the winter has to do with Vitamin D deficiency. Over 90% of my patients are deficient in Vitamin D in the summer time so you can imagine what happens to their levels come winter time. They plummet. Vitamin D is one of the most powerful regulators of the immune response. There are many researchers who are looking into the vast effects of Vitamin D for a myriad of health conditions, not the least of which is cancer, auto-immune diseases, allergies, asthma and other respiratory illnesses and GI complaints. Every member of the family needs vitamin D, not just mom and dad. If you are deficient I recommend that adults take at least 5,000 i.u. per day, young teens and pre-teens can take 2-3,000 i.u. and younger children should take 35 i.u./lb of body weight. High doses of Vitamin C have also been proven to be phenomenal for general immune health and blasting infections quickly. Doses are similar to Vitamin D, 5,000 mg for adults, 2,000-3,000 mg for teens/kids and 1,000 mg for kids under 6. Getting a buffered version is going to be much nicer on the tummy. Another natural immune booster would be a broad spectrum probiotic. I recommend taking at least 20-30 billion organisms/day from multiple strains. Taking immune supporting Colostrum can also really tune up the gastrointestinal immune system and when that is workign well, the entire immune system is in much better shape to handle any type of infection. Last but not least, if you do happen to get exposed to a bug that you haven’t developed natural immunity to in the past and your body responds with they typical symptoms of infection, I recommend using Colloidal silver solutions either as a mouth rinse, sinus rinse or even dropped right into the ears. It is always a good idea to have some of this on hand. Don’t forget about the immune lowering effect of stress, lack of sleep and too much sugar. Most of us are already stressed out, somewhat sleep deprived and eat too much sugar and junk but it seems that the during the holiday season every one of these lifestyle habits takes a turn for the worse. Stress, lack of sleep and increased sugar all can raise our levels of hormones like adrenalin and cortisol and they lower our immune system and make us much more susceptible to infections. Share this with your friends and co-workers and save them from a weekend immune system and toxic exposure from the flu vaccine this year. Hi – It’s Katie’s mom again. I read the above text and wondered if Katie should be on the colustrum and colloidal silver. I know the colustrum is good for healing the gut so would be good for her leaky gut. Just a thought. Question #2 – I’m outside several hours a day in the spring/summer. Is Vitamin D3 necessary then too? I usually stop taking it and resume about this time of year. I’ll reply to the specific question regarding Katie in a secure email but your question about Vitamin D is a great one. There is some evidence that many people are having trouble making enough vitamin d even during the summer months because of limited skin exposure and sunscreens. The best thing would be to just get a blood test during the spring/summer, maybe in mid June, and see how things are doing. That could be a good guideline for you. I will usually tell people to continue with supplementation but to reduce it to 2,000 iu per day during the summer months but that may be too much for someone like you who is out in the sun so much.